"What he really wanted was to spend Thanksgiving with his family. What he got was three days with the turkey." 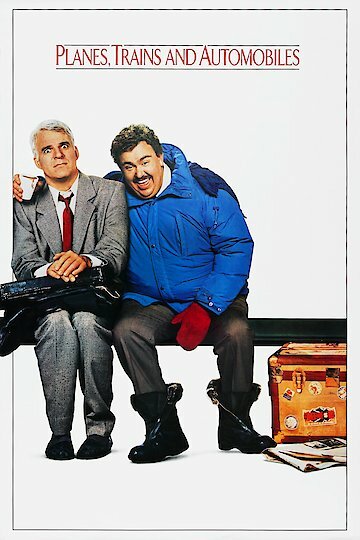 "Planes, Trains & Automobiles" is a holiday movie featuring Steve Martin and John Candy. The movie was directed, written, and produced by John Hughes. The movie is about a high paid, advertising executive from Chicago who is in New York trying to get a big image cosmetic deal finalized, which doesn't go through. The deal is rescheduled to be finalized after the holidays. In a foul mood, Neal Page wants to get home to see his family for the holidays and everything that can go wrong does. What should have been an hour and 45 minute flight turns into a three day journey. Page's (Martin) flight moves him from 1st Class to Coach, eventually the flight is rerouted to Wichita, Kansas leaving Page to travel across country to get back to Chicago. Neal Page played by Steve Martin is forced to spend the next three days traveling across country frustrated and in a foul aggressive mood. Along the way he meets Del Griffith played by John Candy, a shower curtain ring salesmen and all around chatterbox who is never in short supply of jokes which only leaves Page (Martin) in a foul mood. After meeting at the airport the two make the journey across country encountering several obstacles trying every method of travel from trains, to planes, and yes even automobiles. Some of the obstacles include renting a hotel where the only bed available is one Queen-sized bed for the two grown men. Another obstacle, the two endure is when Griffith (Candy) almost kills the two by driving down the wrong side of the highway leaving the car totaled and leaving yet another method of travel as a failed attempt. In the end Page finds out the truth about where Griffith is headed and that he really is alone. The movie ends with a simple message that speaks to everyone on what the true meaning of Christmas is supposed to be and that is family and being together. Planes, Trains & Automobiles is currently available to watch and stream, buy on demand at Amazon, Vudu, Google Play, iTunes, YouTube VOD online.